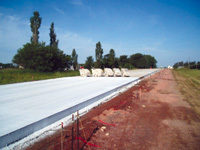 Despite completion of hundreds of concrete overlay projects, some highway agencies are reluctant to use concrete overlays. Some agencies believe that concrete overlays are expensive, difficult to build, and should be used only in limited applications. Because of this belief, it is very important that efficient construction methods be developed to meet the public’s need for mobility, safety, and access to property. The Iowa DOT, counties, and cities have successfully completed a multitude of projects that range from thin bonded overlays (2-4 inches) to thicker (4+ inches) unbonded overlays. Statewide about 1,000 miles of overlay are in use. Objectives of this research include the following: 1. Reduce quantity overrrun concerns with GPS mapping of proposed project. 2. Evalute use of GPS to control longitudinal join sawing. 3. Evaluate milling by the standard practice of string line control and by GPS control. 4. Evaluate use of innovative bond breaker materials. 5. Determin innovative ways of handling traffic control for construction of single lane overlays as part of 2-lane or multilane overlya. 6. Investigate potential ways using both existing and new paving train components so that length of paing overation is minimized. 7. Evaluate pavement strength versus openting time and completion of project time.